If you’re thinking of breastfeeding, or already are, you’re likely to hear people talk about “foremilk” and “hindmilk.” The basic difference is that foremilk is the milk that the baby receives right when she starts nursing, and the hindmilk is the milk that she receives towards the end of feeding, as the breast begins to empty; foremilk has more water and less fat than hindmilk, as fat tends to be “stickier” and doesn’t travel as quickly through the breast. After reading a lot about it on the internet, I still had the impression that the body actually produced two distinctly different types of milk at different times, but it turns out that’s not the case. Whether or not your baby gets hindmilk all depends on how long the baby nurses on the same breast. If the baby is removed from the breast too soon, she’s getting mostly foremilk and doesn’t have to opportunity to get the more satisfying hindmilk. Without getting into too much more detail, if this happens often enough the baby can experience what’s called a foremilk/hindmilk imbalance. You can read a lot more about it in this article by La Leche League if you’re interested. Now the fun part. I had always heard that one’s milk can vary in color, but I didn’t know that one’s foremilk and hindmilk would be distinctly different colors until I finished pumping yesterday afternoon. I took a picture in case any soon-to-be-breastfeeding mommies were interested. Some might think it’s a bit too much information, but I think it’s pretty cool! Pumped from the same breast, on the left is 2 oz. 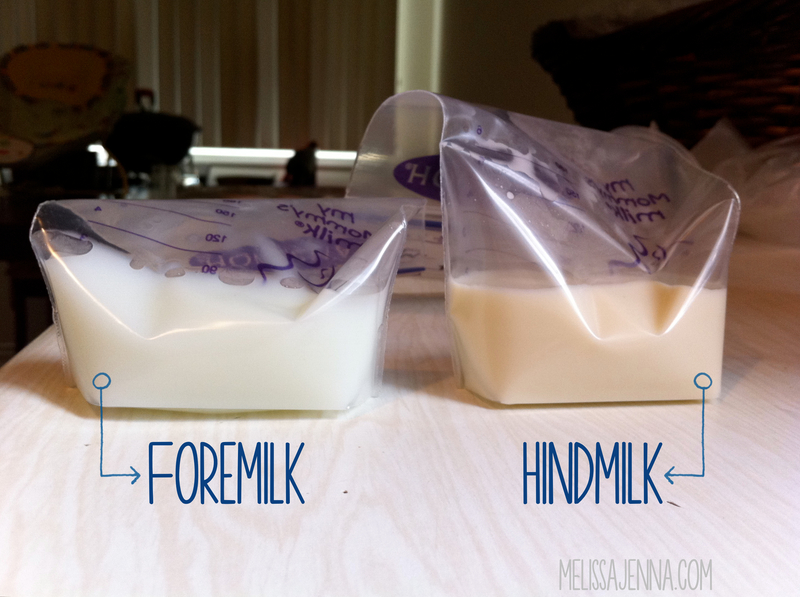 of foremilk, and on the right is 2 oz of hindmilk. Notice how the milk on the right just looks thicker? I feel like with a little more investigation, Alton Brown himself would be proud. Questions about foremilk/hindmilk/breastfeeding/the Food Network? Just want me to know you dropped by? Give me a holler in the comments below. I wish I could have had this information when I had babies long ago. 4oz from the same side? I’m kind of in awe! You know what’s weird? I’m still producing that much. I was told that after 4ish months my body would figure it out, but evidently not. I guess I’m just an over-producer. I wish we had a milk-bank near by, because by freezer is full and I end up throwing milk away. It feels terrible to do that! Hi Allison! I went back into the post, and re-added the image. Would you mind trying to pin it again? Hopefully I’ve fixed it for good. 🙂 Thank you for telling me that it wasn’t working!